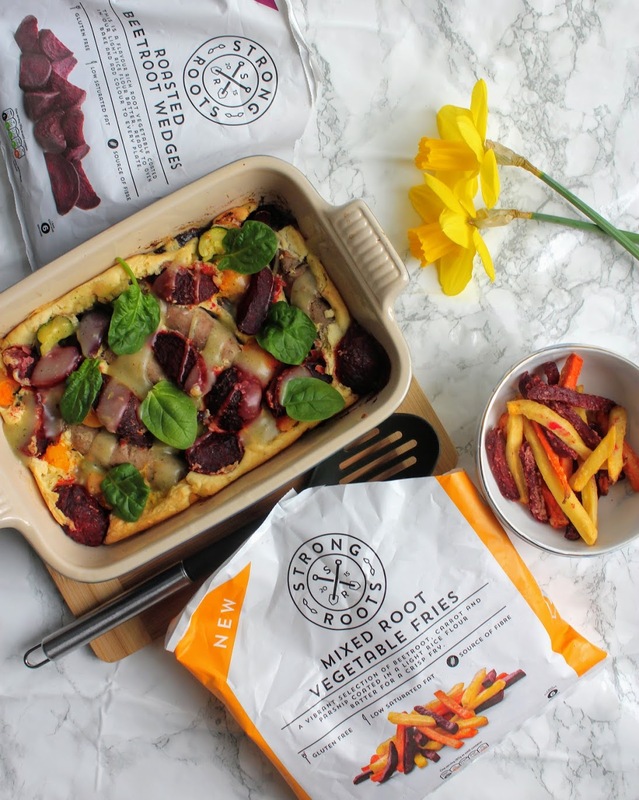 If you’re on the look out for quick, convenient and healthy foods when time is short but you still want to eat well, award-winning brand Strong Roots should be on your radar. 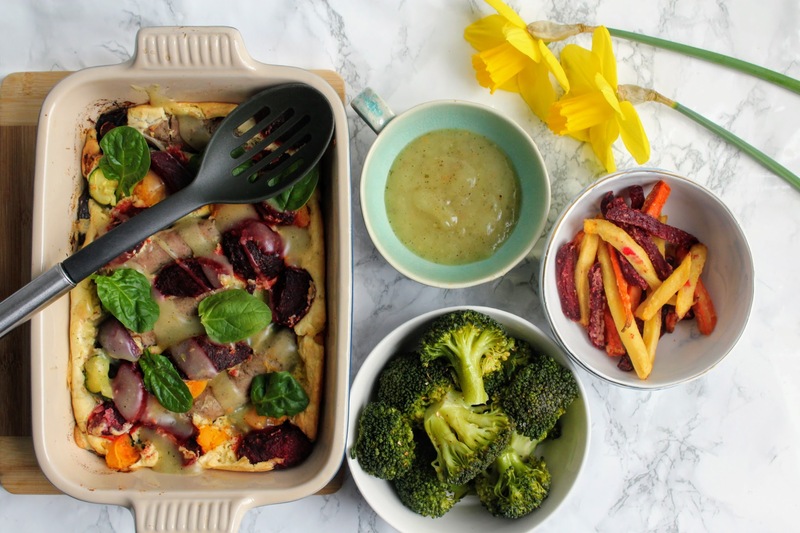 Last year I worked with these guys (check out my Veggie Chilli-Loaded Sweet Potato Fries and Squidgy Avocado & Walnut Protein Brownies recipes!) so it was a pleasure to collaborate with them again here. Offering innovative, delicious and nutritious range of vegetables and veggie meals, Strong Roots was created to help those with busy lifestyles cut corners in the kitchen and enjoy healthy food easily. 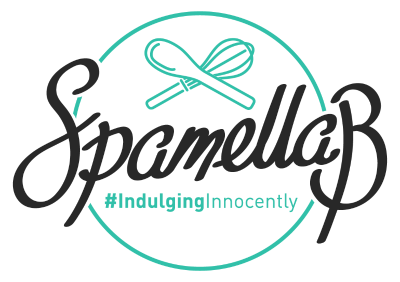 The range includes Oven Baked Sweet Potato Fries, Kale & Quinoa Burgers, Ripened Avocado Halves and Garlic Roasted Sweet Potatoes which are a great source of fibre, vegan friendly, have no artificial flavours and are perfect whether they are enjoyed on their own or part of a balanced meal. The vegetables are frozen from the moment they are picked to guarantee freshness and ensure nutrients are not lost in transportation, which is certainly a tick box for me. 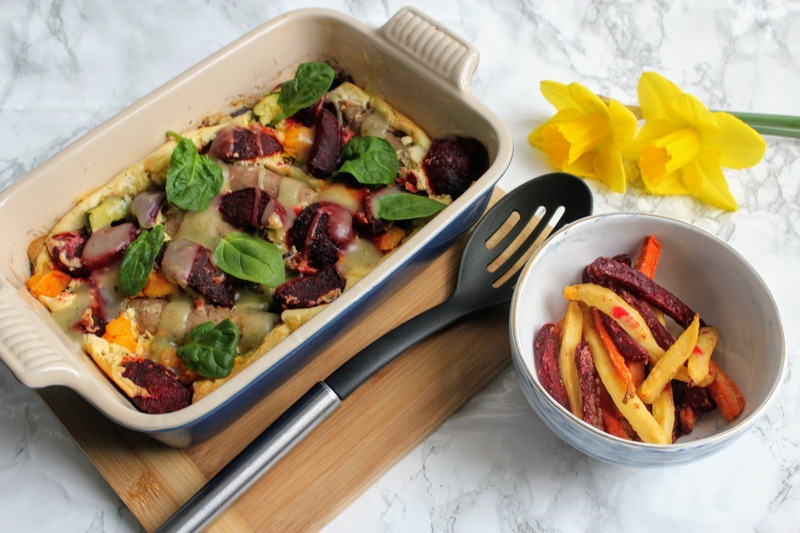 My challenge this time was to create ‘The Ultimate Roast Dinner Recipe’ in line with Easter coming up using the Beetroot Wedges and/or Mixed Root Veg Fries, to highlight the simplicity and ease of being able to make a delicious roast that doesn’t require too much hassle and prep. 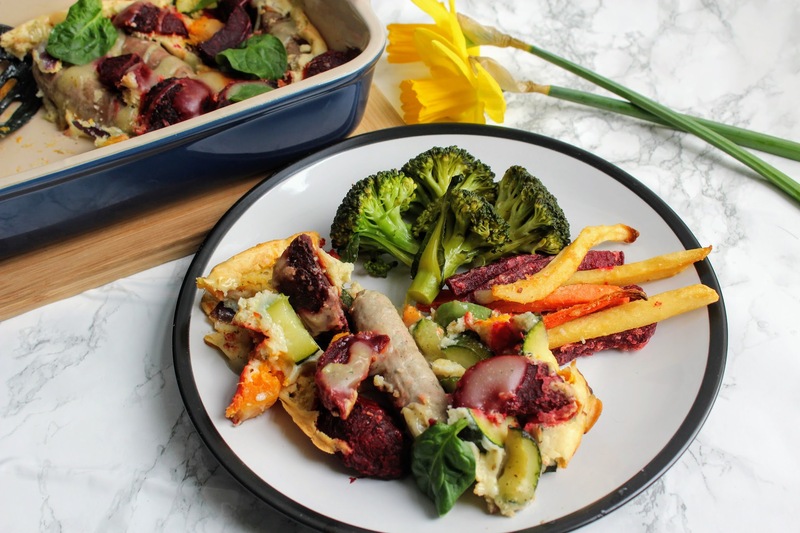 Savoury dishes aren’t particularly my forte but I was keen to take this on – here’s my veggie, gluten-free version of a toad-in-the-hole, packed with veggies and served with the delicious fries plus a seasoned vegetable ‘gravy’. Ideal to serve for any family feast this weekend! Preheat the oven to 200 degrees C and grease a 20cm x 26cm ovenproof baking dish or tin. Drizzle the olive oil in and add the onion, courgette, squash, beetroot wedges and sausages and cook for 10 minutes. Whisk together the flour, eggs, milk and herbs with salt and black pepper. Remove the dish from the over, pour all over, return and cook for a further 2030 minutes until risen and golden. At the same time bake the fries according to packet instructions. Meanwhile make the gravy: Heat the oil in a small pan and add the garlic. Cook gently for 10 minutes then add the stock cubes and water. Bring to the boil and allow the cubes to dissolve. Whisk the cornflour with 1 tablespoon water to make a paste, then whisk in and simmer for a couple of minutes until thickened. Add black pepper. When ready to serve, dish out some of the toad in the hole, fries and broccoli and pour over some gravy. Enjoy!